Douglas Noël Adams was an English author, comic radio dramatist, and musician. His Hitchhiker’s Guide to the Galaxy series began on radio, and developed into a “trilogy” of five books (which sold more than fifteen million copies during his lifetime) as well as a television series, a comic book series, a computer game, and a feature film. The series has also been adapted for live theatre. Douglas Adams wrote or co-wrote three stories of the science fiction television series Doctor Who and served as Script Editor during the seventeenth season. His other written works include the Dirk Gently novels, and he co-wrote two Liff books and Last Chance to See, itself based on a radio series. Adams also originated the idea for the computer game Starship Titanic, which was produced by a company that Adams co-founded, and adapted into a novel by Terry Jones. A posthumous collection of essays and other material, including an incomplete novel, was published as The Salmon of Doubt in 2002. CLICK HERE FOR MORE BOOKS BY DOUGLAS ADAMS. I can’t think of any other SF book which is this incredibly funny, in that droll British way that Americans can never emulate. In 5th grade I first read The Hitchhiker’s Guide to the Galaxy (1979) and three of its sequels, but it’s this book that stays most in memory. I’ve always wanted to revisit Douglas Adams’ story, even though I was a bit worried it might not be quite as brilliant as I remembered, but I can report that the audiobook narrated by English comedian and actor Stephen Fry is the perfect comic voice to capture the spirit of the book. Since the audiobook clocks in at just under six hours, I decided it would be a good companion for a day hike in the mountains an hour from Tokyo. Hopefully none of the other hikers were disturbed by the strange tall gaijin chuckling to himself on the trail. The HITCHHIKER’S GUIDE TO THE GALAXY series can be enjoyed on many levels, so it’s tough to decide how to review it. On the surface, it’s just a zany series of dry British humorous skits ala Monty Python, but when you dig deeper, Douglas Adams has a lot to say about life, the universe, and everything. Taken as a whole, he presents a consistent philosophy that our universe is impossibly huge beyond our comprehension, and our attempts to understand it are woefully inadequate. But we shouldn’t get too upset about it, because it’s much better not to take things overly seriously. Just sit back and enjoy the show, folks. It’s an amazing place. I loved THE HITCHHIKER’S GUIDE TO THE GALAXY series when I read it back in 5th grade. It was one of the first science fiction series I read, shortly after THE LORD OF THE RINGS and THE CHRONICLES OF PRYDAIN. I was just forming my taste in fantastic fiction, and this was the first series I read that was truly funny, featuring dry, ironic British humor no less. It was completely new to a kid growing up in sunny Hawaii, pretty much as far from rainy, overcast England as you can get. In many cases I knew it was clever dialogue, but had no idea what Adams meant. The original HITCHHIKER’S GUIDE TO THE GALAXY trilogy was a massive hit, so it was inevitable that fans would clamor for more. 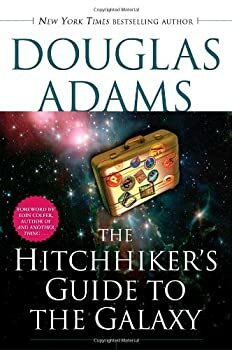 The first three books ranged across the galaxy, a wild ride carried along by an eclectic cast of comic characters, held together by Douglas Adams’ droll British humor, intergalactic hitchhiker Ford Prefect, former President of the Galaxy Zaphod Beeblebrox, Marvin the Paranoid Robot, and grounded by befuddled English everyman Arthur Dent. This time Adams has taken a very different tack, returning to that little backwater planet in an unfashionable corner of the Milky Way known as... Earth.